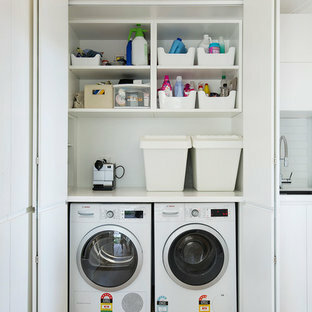 Photo of a contemporary single-wall laundry cupboard in Sydney with an undermount sink, flat-panel cabinets, white cabinets, white walls, medium hardwood floors, a side-by-side washer and dryer, brown floor and white benchtop. 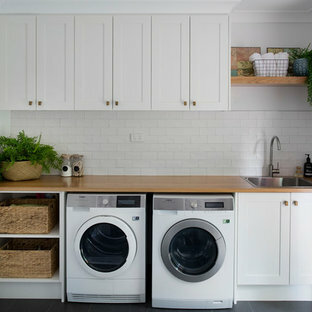 This is an example of a contemporary galley dedicated laundry room in Perth with a drop-in sink, flat-panel cabinets, white cabinets, white walls, a side-by-side washer and dryer, grey floor and white benchtop. This is an example of a small transitional single-wall utility room in Melbourne with an undermount sink, shaker cabinets, beige cabinets, granite benchtops, porcelain floors, a stacked washer and dryer, grey floor, beige walls and beige benchtop. Inspiration for a small contemporary single-wall dedicated laundry room in Melbourne with a single-bowl sink, flat-panel cabinets, grey cabinets, quartz benchtops, grey walls, medium hardwood floors, a concealed washer and dryer, brown floor and grey benchtop. 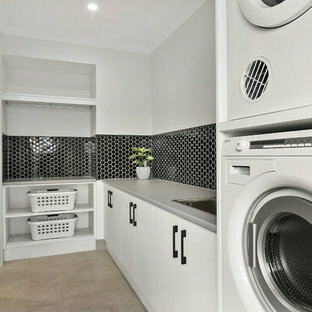 Photo of a country laundry room in Brisbane. Design ideas for a contemporary dedicated laundry room in Other with flat-panel cabinets, white cabinets, grey walls, a stacked washer and dryer, beige floor and grey benchtop. 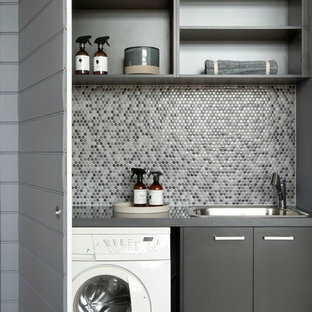 Inspiration for a contemporary galley dedicated laundry room in Wollongong with a drop-in sink, flat-panel cabinets, black cabinets, white walls, a stacked washer and dryer, grey floor and black benchtop. 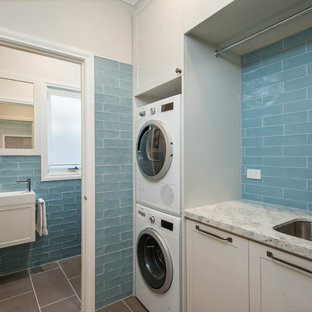 Modern dedicated laundry room in Sydney with an undermount sink, flat-panel cabinets, white cabinets, a side-by-side washer and dryer, grey floor and white benchtop. Design ideas for a beach style single-wall dedicated laundry room in Central Coast with a drop-in sink, flat-panel cabinets, white cabinets, wood benchtops, white walls, medium hardwood floors, a side-by-side washer and dryer, brown floor and brown benchtop. Inspiration for a mid-sized country laundry cupboard in Melbourne with shaker cabinets, white cabinets, marble benchtops, a drop-in sink, white walls and medium hardwood floors. Design ideas for a modern l-shaped laundry room in Melbourne with a drop-in sink, flat-panel cabinets, white cabinets, a stacked washer and dryer, grey floor and white benchtop. Contemporary single-wall utility room in Canberra - Queanbeyan with a drop-in sink, flat-panel cabinets, white cabinets, white walls, concrete floors, a stacked washer and dryer, grey floor and white benchtop. 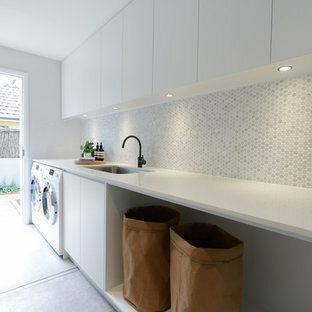 Photo of a mid-sized contemporary single-wall dedicated laundry room in Wollongong with a drop-in sink, flat-panel cabinets, white cabinets, laminate benchtops, white walls, grey floor, white benchtop and laminate floors. 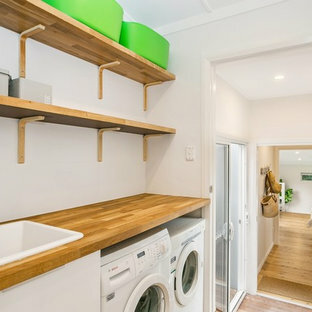 Inspiration for a mid-sized contemporary single-wall laundry room in Sydney with flat-panel cabinets, medium wood cabinets, white walls, a stacked washer and dryer, black floor and white benchtop. Beach style single-wall dedicated laundry room in Gold Coast - Tweed with flat-panel cabinets, white cabinets, wood benchtops, white walls, multi-coloured floor and beige benchtop. 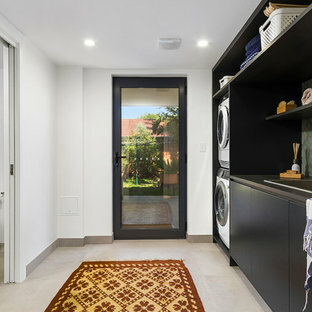 Photo of a mid-sized contemporary single-wall dedicated laundry room in Gold Coast - Tweed with a drop-in sink, flat-panel cabinets, white cabinets, wood benchtops, white walls, a side-by-side washer and dryer, multi-coloured floor and beige benchtop. 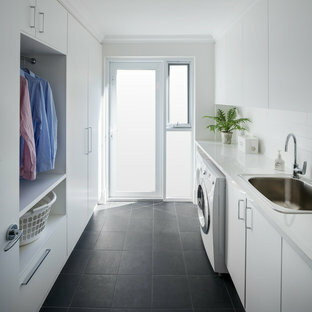 Contemporary laundry room in Brisbane.